This entry was posted in Rescued Dog and tagged #blog. #dogblog, #dog, #Dogsleeping, #rescueddogs by admin. Bookmark the permalink. Aw I’m sorry you have to work in the rain! At least it’s supposed to be rain and not snow. We’re supposed to get a ton of snow here this weekend. My dogs love playing in the snow so that’s good, but I’m not looking forward to having to shovel it all. Do you always feed Layla the same recipe? I’d say just be careful she’s getting a balanced diet. I don’t know much about home cooking as I feed raw, but I know with raw it’s important to feed a varied diet rather than the same thing all the time. Is it the same with home cooked or do you just use supplements to prevent deficiencies? I cook treats for my boys, but their main meals are raw. I hope you have an awesome weekend! Try to stay dry. The meals you’re feeding Layla sound pretty good, I feel as if I would want a bite! Sorry it’s so rainy. Stay dry, Layla! 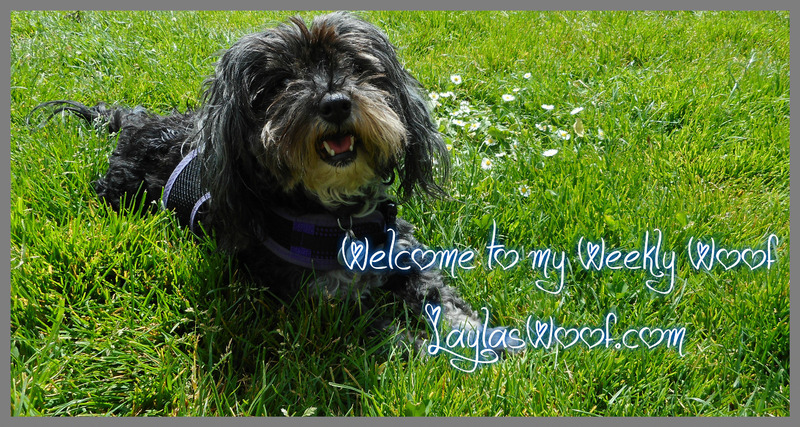 Hi little Layla – you cutie pie! One thing to try – if she’ll eat it, is sweet potatoes. They are much more nutritional than rice. Also, feed a little bit throughout the day – like green beans, etc. If Layla’s energy is low, perhaps try a little bit of manuka honey – that will help a great deal. We give it to our senior and it does make a big difference. You are a great mom – and Layla is lucky to have you!! We hope you guys stay dry! We were supposed to have snow here last night but it turned out to be only rain. I’m not too familiar with dog nutrition, but are there any nutrients missing from the food? Lola stay warm and dry. I am researching and making sure and then researching more. Better the rain than the snow! We were supposed to get two feet but we only got 8 inches. And then it started icing. I think her dinner sounds pretty good but you might want to do research to how it compares to the NRC values. There’s a diet designer program you can use to balance it. It is super overwhelming though. You are a sensible dog mom watching her charge’s health. You are dong the right things for her. I cannot cook for 8 cats so I monitor their health the best I can. Harvey is the only senior and his kidney issues are manages as best I can by mixing Fancy Feast (which he loves) with kidney formula (which he doesn’t!). Marjorie they keep us on our toes when it comes to eating and you amaze me with 8 cats WOW. It has to be hard to know exactly what you should be feeding your dog, especially when you are cooking for her yourself. I know I’m concerned my girls are getting the correct food and I purchased canned food for them. I hope Layla is okay. Thanks and Layla is okay phew. I do not want to start with canned or dried foods as I do not trust them but read your blog where you found they are working for your cats. Layla sure does look cozy in her box. The snow is deeper than my dogs are tall right now so they will be staying on the paths in our yard. It is really really cold, so none of us want to go outside anyhow. Oh, miss Layla, a Gotcha Day coming up, how exciting!!! Happy early wishes to you! I just loved your snoring video!!! We are dealing with tons of snow and an extreme cold weather warning – it feels like -40 out there. I think I might prefer rain at this junction. Sometimes I wonder why we choose to live her. LOL On the food front we have our meals made from scratch too but never the same thing for more than 3 days (a batch will last that time) then we switch up. Trying to avoid allergies or intolerance that come from eating the same thing too often. You? PS: liking the new look! I can’t believe it’s mid January either, time certainly is flying. I hope Layla remains in good health. You take such good care of her. The rice for carbs is a good addition I think. I think we’d rather have rain. We had a crazy cold; -30 degrees Celsius. That is not good for any fun outside at all. We love veggie smoothies too! It actually seems like January is the slowest month of the year – it’s so grey and cold, and there’s no holidays – it’s going on forever! I love them too as she does not know what veggies she is eating LOL. It has been sunny the past few days after a week of rain and January is slow but going fast if that makes sense.